Canada played a large and important role in World War I. As part of the Commonwealth, it immediately entered the war as soon as Britain declared war on Germany, so it was involved from the very beginning. Its troops fought courageously throughout the four years of war, and the conflict had a huge effect on the country, leading to greater independence. However, like many other countries, it also suffered great losses. Canada’s war began on August 4, 1914, the same day that Britain declared war on Germany. Canada joined automatically because it was part of the Commonwealth, but the government could still determine exactly how involved the country would be in the war. 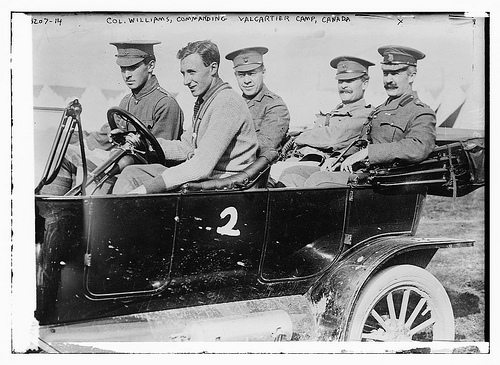 When the Governor General declared war the following day and immediately raised an independent Canadian Expeditionary Force, it was clear that Canada would play an active role in the war effort from early on. The first important battle for Canada in WW1 was the Battle of Second Ypres, which took place on April 22nd, 1915. During this battle, the Canadian Division were outnumbered, and the battle is known for being the first time that chlorine gas was used as a weapon in the war. As a result, 6,000 soldiers were either captured, killed or injured, which made up an entire third of the force. However, it was not a complete disaster because the Germans did not manage to break through. Beaumont Hamel was another important battle in the war for Canada, but it has gone down as one of the worst moments for the country. The battle took place on July 1st, 1916, and it involved the Newfoundland Regiment. Due to a serious miscalculation, the troops tried to attack through barbed wire that had not been cut, and they suffered heavy casualties. 801 soldiers attacked, and in half an hour 324 had died and 386 were wounded. One of the greatest victories for Canadian forces in WWI was the Battle of Vimy Ridge. This took place over four days from April 9th to April 12th in 1917. It was a well planned and executed attack on a German strong point that achieved its objective. One of the worst battles for Canadian forces in terms of casualties came in the Battle of Passchendaele. This took place in 1917 and lasted from October 26th to November 10th. The weather conditions were terrible, and the fighting was particularly brutal. As a result, 16,000 troops were killed or wounded during the battle. Despite the loss of life, the forces managed to achieve their objective. One of the most famous campaigns in Canada’s involvement in the war is now referred to as ‘The Hundred Days’. This was a serious of battles that lasted from August 8th right up to November 11th, 1918, the last day the war. Canada played a major role in these battles, and it was successful in driving back the German armies. Nearly all of Canada’s involvement in the war took place in Europe. However, before the war ended, during the summer 1918, the war came to Canada when German U-Boats attacked the east coast of the country. Without strong defences, the coastline could have suffered huge damage, but fortunately the war ended before too much destruction could be caused. The population of Canada was below 8 million at the outbreak of war. At the end of the war, 619,000 had joined the Canadian Expeditionary Force, a huge contribution from the country. Of those that fought, 67,000 were killed and 250,000 wounded, and the figures demonstrate the enormous contribution made by Canada during the war.